Since build 190108 i'm facing the following problem, which i decided to ignore... but right now i got a notification about a new 190310 version and again the same issue. This generated a ConEmu.190310.213501453.log file containing the following. Any hint on what's going on here please? This looks like a common problem of msi, not related to ConEmu. Sorry about that, and thanks for googling for me. 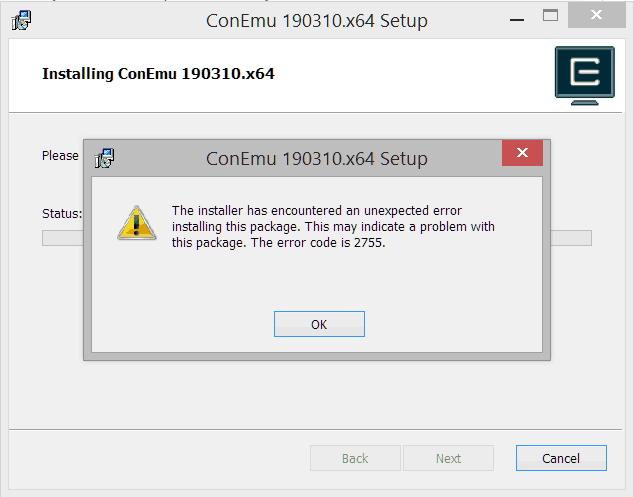 Although afterwards still the same 2755 error attempting to install ConEmu. Will try to do some more research about this and can post results of how it went if interested, if not feel free to close this as obvious off-topic. Does any other msi work? Try to unpack Installer files (call "ConEmuSetup.exe /?" for switches) and run msi file from explorer. I have no more ideas what happens in your side. ConEmuSetup just unpacks files (same as you have done manually) and runs msi. It's interesting what will happen with next it previous build of ConEmuSetup? Will it fails again? If so, comparing command lines of msi for failed and succeeded runs may help. 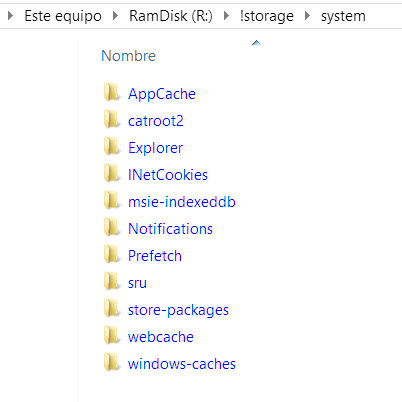 Well, fwiw i have a few Windows folders symlinked to a RAMDisk, not sure whether the installer is finding some of those folders are behind a symlink/junction and choking on them? FYI: Attempting to upgrade to 190326 using the same manual extraction method just realized that if i do this from the RAMDisk it does fail with the same 2755 error, however if i do move the *.msi file to a normal HDD then it does work fine, ha! gh-1870: Add switch `/t:<temp dir>` to Setupper. Ability to specify temparary directory for msi files. installer command, e.g. : `"%1" /t:"C:\Temp\ConEmuFiles"` /p:%3,adm /qn`. * `GetTempPath` API function if variable is not defined. I see you're making changes to allow specifying the temp path, thanks for that!